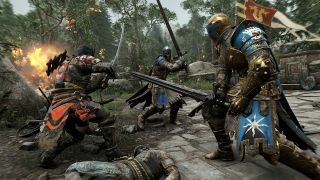 With one beta down and another on the way, the developers of For Honor are gearing up for a big launch as their multiplayer-focussed hack-and-slash prepares to go live. But the game’s focus on fast-paced technical combat has led to some concerns that its use of peer-to-peer networking rather than dedicated servers may upset its delicate competitive balance. In particular, people are worried that the P2P networking may give the hosting player an unfair advantage. On this latter point, the game’s creative director, Jason Vandenberghe, is adamant that no host advantage exists. Vandenberghe says the reason for the confusion has come about because of the shortcomings of other P2P technologies (he says it’s perfectly reasonable to be scared based on the technology’s performance in the past), whereas For Honor isn’t a traditional peer-to-peer system. The system is called ‘the simulation’, and came about due to the way the game has to handle eight simultaneous players interacting with around 200 AI characters on the map. However, the creative director has indicated that the team is open to reassessing the technology post-launch based on how the game performs. The game has also come under fire for featuring a locked 30fps framerate on consoles, a choice that Vandenberghe is keen to defend based on the resources available. However, players not satisfied with compromises will also be able to pick the game up on PC, where it features a completely unlocked framerate. Ubisoft has received a lot of flack in recent years for its more controversial decisions, but it seems as though the publisher has taken these criticisms on board, and has made efforts to fix games that have had challenging launches. From the success of its betas so far, For Honor doesn’t currently appear as though it will face the same challenges, but it’s nevertheless reassuring to see its developers so proactively planning to monitor and fix problems as they arise.